Not strictly a Highbridge related tale, but a cautionary pointer from a plastic seabird in a near neighbour! Recently, new signage was erected all over Weston-super-Mare in an effort to make the town 'legible' to visitors. The new signage was plagued with errors, omissions and the inclusion of strange details which were unlikely to interest even the most avid fan of the slowly decaying resort. 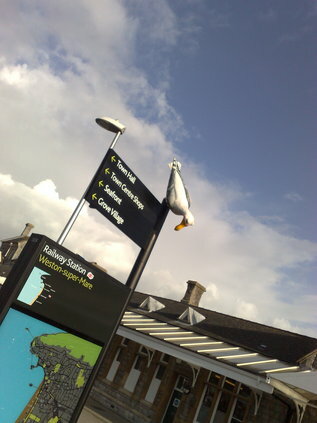 Tonight, as I made my way home via the railway station, I noted the allegedly humourous comedy seagull which sits atop the sign had apparently tired of his vigil over the hordes who pour out of town to jobs in Bristol each day. Or, more possibly perhaps, locals had brought the country into town with a good old fashioned duck hunt?